You work somewhere, yeah? Good. Now does your company do its best to identify talent that it can utilize over the long term while its value increases, or do they bring in people on high wages let go by lesser companies who are past their prime compared to other talent in the field? Jon Daly may be a fine human being and have experience like you wouldn't believe. However, statistics and common sense say that he's an average footballer at two positions. He's 30 in a sport where unless you're Davie Weir that means you're past the glory days. Experience is some measuring stick used by punters that cannot be qualified. I believe it's some odd combination of leadership, grit, guts, determination, heart and staunch. It's used as a leveler for players like Jon Daly who just aren't that great at football. "He has experience." That he may, but he doesn't have a great goal scoring record or one position on the park he excels at. You get this in all sports. You get players coming off the backside of their prime who were capable pros, good players, say someone like Jon Daly. And you get organizations obsessed with these old-timey metrics that just don't stack up anymore. What matters is how good the man is at his job, in this case football, and how good he will be over the duration of his contract. That's not to say intangibles don't enter in the equation, but they certainly should dictate the decision from the start. Companies don't begin the on boarding process with the interview – talent comes first. It has to come first, always. See, the thing is Rangers aren't an "experience club," they're a football club. And therefore how good someone is at football is more important than experience. It's pretty simple. And they're also a business that trades in the market of the football economy, so how much value a given player can potentially bring to the club is paramount. That means talent and at an age where long term potential is high and sell on value is crucial. Jon Daly, yeah, he can play a couple positions and he's got that precious experience. But he's not a better football player at either of those positions than three or four players we have at each already. He's at a stage in his career where he's a role player for a team that needs to fill out a squad, not a marquee signing on high (relative) wages. There is no growth potential, his contract will certainly not represent value for money over its duration, and there's no chance of sell on value down the line. 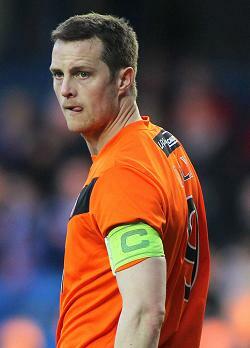 To put it frankly, Jon Daly is exactly the kind of player Rangers should not be signing. And that's not a slight on the man as a professional; it's the reality of where our club is and where it needs to be in one year, three years, five years. Stop gap signings are wholly unnecessary at this level with our resources. If anything, we should be trying to shed contracts like the one Daly will receive, not add more to the books. I'll cheer for the guy when he pulls on the shirt, but if this is the direction we're taking as we look to build a squad that can compete immediately when we arrive back in the top flight we've got issues. At least we have experience in watching overpaid players past their sell by date flounder away at Ibrox, eh?